Why have I been thinking about this, you ask? Mostly because of the conversations we’re having in this month’s horror movie series on the podcast! Check it out and we’d love to hear what you think. What the Break Into Act 2 has to do – or does it? The “rule” I’m talking about (and I do mean “rule” because you know there are no rules – only tools) is what happens at the break into Act 2. When we talk about the function of that plot point, a common understanding is that it should establish a goal for the protagonist to pursue. Establishing a goal at the break into Act 2 helps your story by launching a throughline of action for the audience to follow. Letting the audience know what target your character is aiming for gives us a comforting sense of direction. When we don’t have some idea where we’re headed and a sense we’re working on getting there, there’s a window of time (which varies for everyone, but is usually pretty short) before we hit a discomfort threshold and check out. However, a lot of times in horror movies it doesn’t feel like that function of the break into Act 2 is being fulfilled. To be clear, that’s not to say the movies I’m talking about aren’t fulfilling that function. But at first glance it might seem like they’re not, and we have to look a little more closely to see exactly what they’re doing to pull it off successfully. In movies like The Babadook and A Quiet Place, it feels like we move into Act 2 without a strong turn defined by a clear goal coming into play. But that’s not because there isn’t a goal the characters want to pursue. It’s just that in some horror movies, and these two are prime examples, the goal is simply “to survive.” And that can make for a particularly subtle act break. Also, since the characters are probably trying to survive from even before the break into act 2, it can feel like nothing has really changed at that plot point. The goal “to survive” has already been in play, it’s not newly established there. That’s what it looks like on the face, anyway. But we can see that the movies that do this well do a few key things to make it work, and it’s all about the context. Act 1 gives us the necessary context for the story. It tells us who we’re watching, where they are, when they are, what’s important to them, what major change or problem or opportunity comes into their life (the inciting incident), and – fairly soon after – what they’re going to do about it (the break into Act 2). When “what they’re going to do” is simply “to survive”, it’s really important to establish in Act 1 exactly what it is they’re surviving from. We need context that tells us what the situation is, including the nature of the danger or threat. Movies that do this well still impart a feeling of turning from Act 1 into Act 2, even if that turn is kind of imperceptible to the naked eye. Movies that don’t do this well often end up feeling like there’s nothing happening between the Inciting Incident and the Midpoint. And scripts where nothing happens for long stretches don’t tend to win over many readers. How is your horror movie structured? For contrast, a movie like The Ring doesn’t attempt this “subtle break into Act 2” trick. In The Ring, the writers used the device of a mystery to give that story its shape. It’s a horror whodunit. The goal is “to stop the curse by solving the mystery of the videotape.” The Inciting Incident shows main character Rachel being asked to look into a mysterious death. She quickly learns about a curse which may be at the root of it all. The Break Into 2 is when she brings the curse on herself, so now she HAS to solve the mystery in order to save her own life. The Babadook – surviving when your kid seems to be haunted or cursed or possessed or something, and may intend to kill you. A Quiet Place – surviving when survival depends on the group and that group is fractured, and there are monsters out there who want to kill you. An abandoned town, ‘Missing’ posters. A family scavenges in a looted grocery store. We meet deaf older sister and youngest brother – he wants a rocket toy. Mom’s getting meds for ill middle son. Youngest son almost makes a noise – everyone reacts. Dad says youngest son can’t have the rocket toy – “too loud” – but sister secretly gives it to him. Walking home, youngest boy makes noise. Dad’s too late. Creature grabs him. Day 472. The family is still surviving. Adapted to this life. Dad studies and tries to make contact with other survivors. Mom’s now pregnant. Prepares baby’s area; a box, oxygen tank/mask. Alone, Dad grieves lost son. Kids prep walls of bunker. Dad lights fire atop grain silo. Dinnertime. Daughter doesn’t want to “call” dad for dinner, mom makes her go. They pray before eating. We see daughter pull hand away from dad’s. After dinner, kids play Monopoly. Accidental noise/fire. Tense waiting to see if the creatures will come. Noises on roof – just raccoons. Elsewhere on the farm, we see the raccoon killed by the creature. Those are both movies we’ve discussed this month on Movies! The Podcast. And in one of those episodes, Jesse pitched a horror movie about a bachelor party gone wrong. One of the things we talked about solving in his pitch was getting the story moving more quickly, which in this case is largely about getting the context in order. Since his characters’ story goal is “to survive” this bachelor party gone wrong, then the setup needs to show us what they’re surviving. Meaning, what’s gone wrong to make this a dangerous situation. It’s not a story about surviving a bachelor party. It’s a story about surviving when a bachelor party goes haywire. So that’s the context we need to get the story moving properly into Act 2. There are non-horror movies that do this too. Paul Greengrass’s new movie, 22 July, about a terrorist attack in Norway, is similar in structure. We see the context in Act 1: what dangerous thing is happening, who it’s happening to, and why that matters. With that firmly established, we’re invested in seeing if and how they will survive, which is what we’re shown as we enter Act 2 and throughout the rest of the movie. 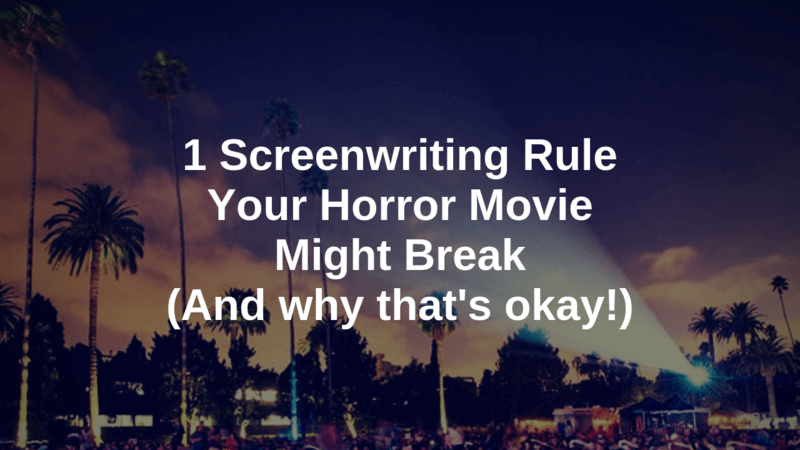 So if you’re writing a horror movie – or any genre, really – where the story goal is something like “to survive,” pay attention to the setup and whether you’re giving the audience the context to fully understand what the characters are up against.